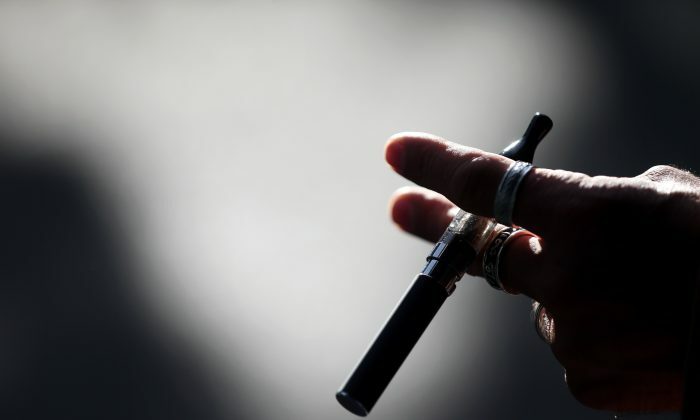 CHICAGO—Chicago may soon be the first major city to prohibit electronic cigarettes in public. According to city officials, the law will protect young people from nicotine addiction. E-cigarettes are battery-powered devices that look much like their combustible cousins. However, they release nicotine vapor instead of tobacco smoke. All of the major tobacco companies have a brand in the marketplace. Sales for e-cigarettes are projected to reach nearly $1.8 billion by the end of the year. NJoy, Vuse, MarkTen, and other e-cigarette brands are smoke-free, granting nicotine consumers a socially acceptable alternative to tobacco products. However, New Jersey, North Dakota, and Utah have recently decided that e-cigarettes should also be banned from indoor public spaces. Officials in Chicago and New York are hoping to enact a similar ban—restricting e-cigarette use to private homes, vehicles, and hotel rooms designated for smoking. The goal is to prevent children from getting the impression that smoking is socially acceptable. “This is part of our overall strategy to address the impact of tobacco on youth. We’ve seen a decrease in youth smoking, then a plateau. We really need to break that plateau,” Chicago City Health Commissioner Dr. Bechara Choucair told the Chicago Sun-Times. According to the U.S. Food and Drug Administration (FDA), e-cigarette consumers can’t be sure whether the devices are safe, or how much nicotine or other potentially harmful chemicals are being inhaled. However, since e-cigarettes do not contain tobacco, they are currently not subject to federal regulation. FDA is in the process of extending its authority on tobacco products to include e-cigarettes, but city and state officials want to close the regulation gap now. Under the proposal in Chicago, e-cigarette retailers would require a license, devices would stay behind the counter, and sales to minors would be prohibited. E-cigarette makers defend their product as a less harmful alternative to tobacco. Craig Weiss, president and chief executive of NJoy argued that restricting e-cigarettes to private spaces might actually harm public health. “I think you have to ask yourself, if you make it just as inconvenient to use an electronic cigarette as a tobacco cigarette, people are just going to keep smoking their Marlboros. That does not benefit the public,” Weiss told the New York Times. The Chicago City Council will vote on the proposal some time in December. If passed, the new ordinance will go into effect January 2014.